Wayde Van Niekerk ranks up high once again in Lucerne after the 43”96 obtained on the 400m in Paris during Diamond League. This time, he managed to enter another small group of great athletes: those able to run the 400m in less than 44” and the 200m in less than 20”, along with Michael Johnson, LaShawn Merritt and Isaac Makwala. Van Niekerk grabbed the South African national record running the half-lap in 19”94, taking it away from Anaso Jobodwana, who was racing in Lucerne as well (20”12). 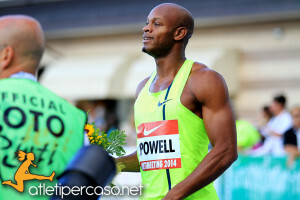 Asafa Powell keeps roaring as well, on his research for the “100 times below 10 seconds”. The Jamaican sprinter came close to his seasonal record running in 9”87, improving his best time on Lucerne’s track, where he had run in 10”10. The counter displays 88 times below 10 seconds for Powell. Great competition in 100Hs, where in the two series the best ones competed: Brianna Rollins, Queen Harrison and Sharika Nelvis. Among the three women, Harrison succeed with 12”62, followed by Rolling in 12”66 and Nelvis in 12”72. The current Under 23 European champion Noemi Zbären was in the race as well, running in 12”90. After her failure in Diamond League Valerie Adams came back to victory as well, even if she is still looking for her best condition after the long period away from competitions; for the kiwi thrower an average 18,73. Good race in the 3000m men as well, where a new record for the meeting has been set by Lopez Lomong, who run in 7’42”19, ahead of the immortal Bernard Lagat, second with 7’42”45, record tor the M40 category. In the end, it is worth to note the new Bahamas record, set by Jeffery Gibson, 48”77 following a great progression.